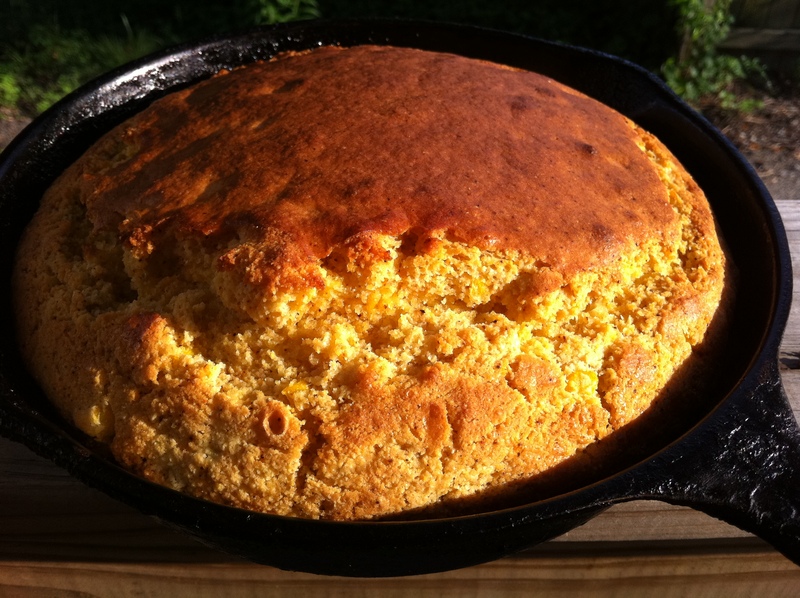 Cornbread tastes better when it is prepared in a cast iron skillet! The addition of whole corn kernels, green chilies and chili powder make this recipe hard to beat. Although some people swear by boxed cornbread mixes, I firmly believe that there is no reason in the world why anyone should ever have to buy one of them. Cornbread is one of the easiest breads to make and it goes great with everything, including slow-cooked beans, soups, stews, chilies, fried catfish, seafood gumbo, barbecued brisket and more. It’s no wonder that cornbread is a Southern staple, served on almost every self-respecting cook’s table. Sometimes it seems like there are as many cornbread recipes as there are cooks. But there are a few things you need to know before making cornbread for the first time. First, the best cornbread is made in a cast iron skillet. If you don’t have one, buy one. I use an 8-inch skillet for this recipe. In an emergency, you can prepare this in an 8-inch square glass baking dish, but there is something magical about the way cornbread cooks up in cast iron. Once you make it this way, I promise you will never want to go back to glass bakeware again. Second, use a high quality cornmeal. I prefer Aunt Jemima’s Yellow Corn Meal. But be careful not to buy the self-rising kind that comes in the round box. Buy the five-pound bag. It might seem like a lot if you have never used cornmeal before, but believe me, once you start cooking with it you won’t want to stop. You can use it to bread chicken, fish, make hush puppies and more. Finally, this cornbread always goes quickly, so if you’re feeding a lot of people, be sure to make multiple batches. It is simply that good. Now let’s get to cooking! Preheat oven to 425°F. Pour 3 tablespoons vegetable oil in an 8-inch cast iron skillet and heat in the oven for 3 minutes. Remove and set aside. In a large bowl, combine corn meal, flour, sugar, baking powder and salt. Add milk, egg, corn, chilies, chili powder and 1/4 cup vegetable oil. Beat until fairly smooth, about 1 minute. Pour batter into skillet. Heated oil should rise and cover the edges of the batter, this will give your bread a crisp crunchy edge. Put skillet in oven and bake for 22 to 25 minutes or until toothpick inserted in the center comes out clean. Remove from the oven and serve. TIP: Top bread with 1/2 cup Monterey Jack cheese for a Mexican meal. Honey, butter and molasses also make great toppings. Growing up in the South, I frequently discovered marvelous one-pot dinners made with easy-to-find ingredients. For many families, both money and groceries are oftentimes in short supply, and out of necessity cooks learned to make due with what they had on hand. Dishes like gumbo, etouffee and dirty rice utilize simple items including rice, legumes, vegetables and bits of meat or fish. Many of these dishes remain favorites to this day. 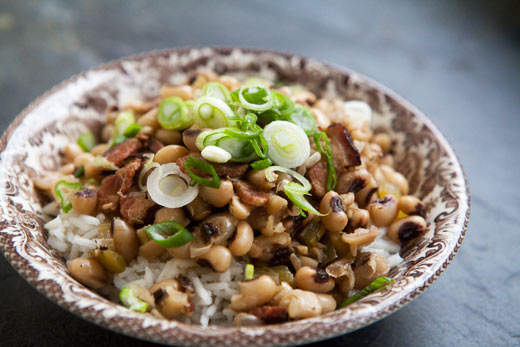 With Hoppin’ John, the earthy flavor of black-eyed peas combined with bits of salted pork and a dash of spice create a mouth-watering treat that satisfy the biggest appetites with minimal cost. Pork and black-eyed peas come together to create Hoppin' John, a spicy Southern staple. In a large Dutch oven, cook bacon over medium heat for about 8 minutes, or until crisp. Remove bacon with slotted spoon. Set aside. Add onion to drippings; cook 5 minutes or until tender. Stir in black-eyed peas, bacon, water, ham, cayenne and black pepper. Bring to a boil; reduce heat. Simmer, covered, for 35 minutes. Return to boiling. Stir in rice and remove from heat. Let mixture stand, covered, for 10 minutes. Stir in scallions before serving. TIP: Although this dish can be served alone, the meal can be rounded out with hot skillet cornbread and a mess ‘o greens.